As part of Phase Three | CURRENT: Contemporary Art from Scotland Ross Sinclair will undertake a two-week residency at the Shanghai Himalayas Museum ahead of his solo exhibition Real Life is Dead/Long Live Real Life. The residency focuses on participation, for which Ross Sinclair will collaborate with participants responding to the two songs at the core of his exhibition, Real Life is Dead/Long Live Real Life. Over the last year Ross has worked with students at Glasgow School of Art to develop and record these two new songs in English and Chinese. The lyrics, which give the exhibition its name, herald a new phase of Sinclair’s on-going ‘Real Life’ project, echoing the problems and tensions of being in this contemporary moment. 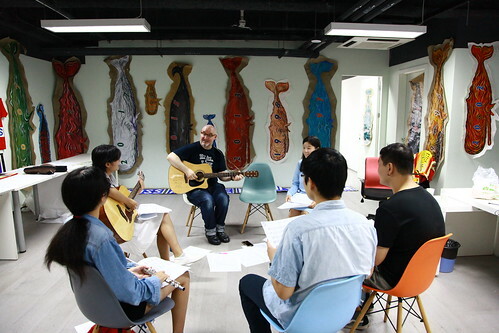 In Shanghai, Sinclair will work with local musicians, artists, singers and publics to create The Chinese-Scottish Real Life Orchestra - a musical dialogue between Chinese audiences and Sinclair’s Real Life project. 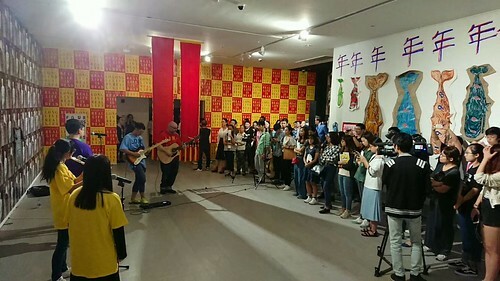 This new group of Realifers will come together in collective voice, in both Chinese and English, with guitars, keyboards, drums and traditional Chinese instruments to share experiences of each other’s ‘Real Life’. The Chinese-Scottish Real Life Orchestra will evolve throughout the residency, bringing to the fore the collaborative ethos inherent in Sinclair’s practice. This new improvised group will present a live performance at the opening reception of the Phase Three exhibitions of CURRENT: Contemporary Art from Scotland. During the residency Sinclair also invites participants to respond in words and pictures to the themes of Real Life is Dead/Long Live Real Life. 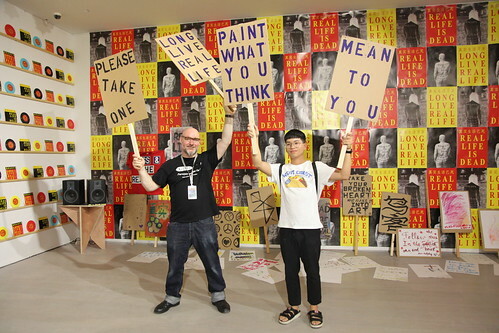 Painted banners and placards will hold these responses, allowing the individual and collective voice to resonate throughout Sinclair’s exhibition. The residency is kindly supported by the British Council, and is one of the programmes in the Spirit of Youth campaign in 2017, brought by the UK government including the British Council and Visit Britain. Ross Sinclair rehearsing with members of The Chinese-Scottish Real Life Orchestra. Ross Sinclair performing with The Chinese-Scottish Real Life Orchestra at the opening reception. Ross Sinclair inviting audiences to Paint What You Think. Ross Sinclair is an artist, writer and musician and is currently Reader in Contemporary Art Practice in the School of Fine Art at The Glasgow School of Art. He is best known for his Real Life project, initiated when he had the words REAL LIFE tattooed in black ink across his back at Terry’s Tattoo parlour in Glasgow in 1994. The Real Life project has been disseminated across a range of exhibition and publication contexts, positioned against a critical framework of contested models of audience participation. This has built a 23-year ’durational performance project’ that connects with the public at a dynamic intersection of ideas, context, performance and art-practice. Sinclair was one of the key figures in the boom of Glasgow contemporary art in the 1990s when contemporary artists from Scotland made a provocative stir in the international art scene, which was dubbed by curator Hans-Ulrich Obrist as “the Glasgow miracle”. Having utilised music throughout his practice since the 1980s, when he was a founding member of one of Glasgow’s most popular indie bands, The Soup Dragons, Sinclair has been a leading artist in the collaboration between art and music in Scotland. In 2015 he released a gatefold vinyl album with booklet documenting a 3-year project with Collective Gallery in Edinburgh 20 Years of Real Life: Free Instruments for Teenagers where he worked with young people developing, recording and releasing music made on instruments given away for free during his exhibition of the same name at The City Dome, on Calton Hill in Summer 2014. Ross has exhibited widely internationally. In 2016 Sinclair was a Visiting Fellow at St Johns College, Oxford University, where he undertook a 3-month Artist in Residence programme making a series of site-specific works. In 2015, he was commissioned by UK Parliament to contribute to a year-long project in Westminster Hall, Palace of Westminster. Sinclair has also published many essays and texts in books, journals and magazines and has written extensively on the generation of Scottish artists emerging from the 1990’s onwards, recently contributing an essay on (2010 Turner Prize winner) Susan Phillipsz, entitled Socialism in Her Heart, to the Artangel/Konig monograph ‘You Are Not Alone.’, 2014. Recent exhibitions include: We Love Real Life Scotland, as part of the nationwide survey, Generation: 25 Years of Contemporary Art in Scotland, GOMA, Glasgow, 2015-16; OVER OVER OVER, Simone de Souza Gallery, Detroit, 2015; Real Life Rocky Mountain, Scottish National Gallery of Modern Art, National Galleries, Edinburgh, 2014-2015; 20 Years of Real Life, Collective, Edinburgh, 2014; Real Life Top Ten Songs of Wales, Locws International, Swansea 2014; I Tried to Give Up Drinking with Guitars instead of God, The Duchy, Glasgow, 2013; and Real Civic Life, Angelika Knäpper Gallery, Stockholm, 2010. CURRENT: Contemporary Art fromScotland (Phase Three) is a collaborative project between Cooper Gallery DJCAD, University of Dundee in Scotland and Shanghai Himalayas Museum, in partnership with British Council. It is one of the programmes in the Spirit of Youth campaign in 2017, brought by the UK government including the British Council and Visit Britian. CURRENT | Contemporary Art from Scotland is kindly supported by the British Council, China-UK Connections through Culture, The National Lottery through Creative Scotland, Scottish Government, and is part of the Spirit of Youth programme. CURRENT is a direct result of the Research and Development Trip (January 2014) funded by Creative Scotland.